Before we purchase a domain name, I want to introduce you to another tool for brainstorming available domain names: bustaname.com. This simple tool lets you specify a few words or fragments, and then shows you which domains made up of those words (in any order) are actually available. 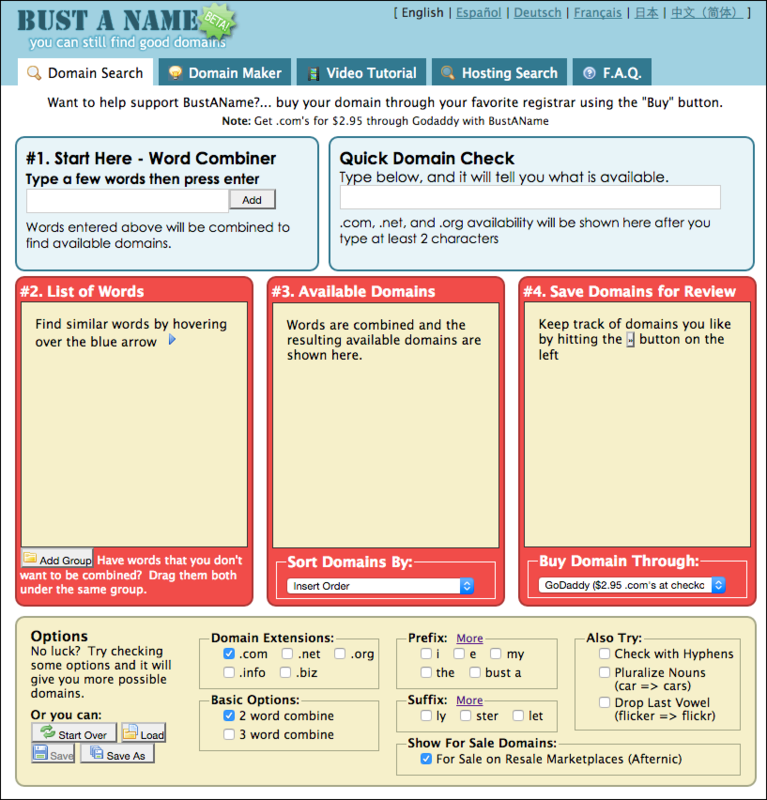 bustaname.com searches domain availability for combinations of words you specify. Let’s use an example: I’ll throw the words “askleo”, “on”, and “business” into the tool. Specifying candidate words in bustaname.com. The first thing to notice is that not all the words need to be words. Since bustaname is limited to three-word combinations, I’ve combined “ask” and “leo” into a single word for this. Click on Add and bustaname.com goes to work. Before we look at the results, however, I want to alter a few options. Specifying options to the bustname.com tool. The default only takes your words two at a time, so check “3 word combine”. Also, uncheck “For Sale on Resale Marketplace”. While the secondary market can sometimes be interesting, you want to start by looking for domain names that are available simply and directly. As you change options, bustaname.com updates the results. 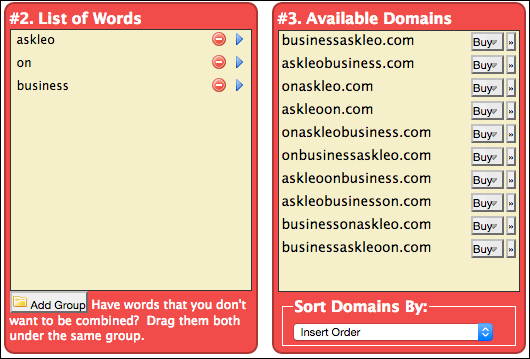 In our example for “askleo”, “on”, and “business”, you can see we have several available domains. bustaname.com shows available names based on the specified words. As you can see, the one most attractive to me, askleoonbusiness.com, is actually available. If it were not, I would try additional words, different words, or remove words that are less important. Click on the blue arrow next to words in the word list to consider some synonyms. Essentially, I’d keep trying different words, looking for different combinations of words that made sense for however the domain name is going to be used. If you find a domain name that appeals to you, click the Buy button, and bustaname.com will direct you to any of several domain registrars. 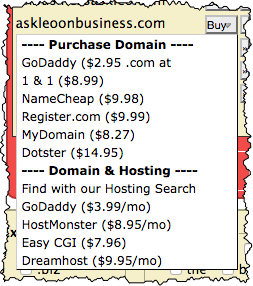 bustaname.com shows buy options for an available domain. Personally, I never use the bustaname.com buy links, though there’s really no reason you couldn’t. 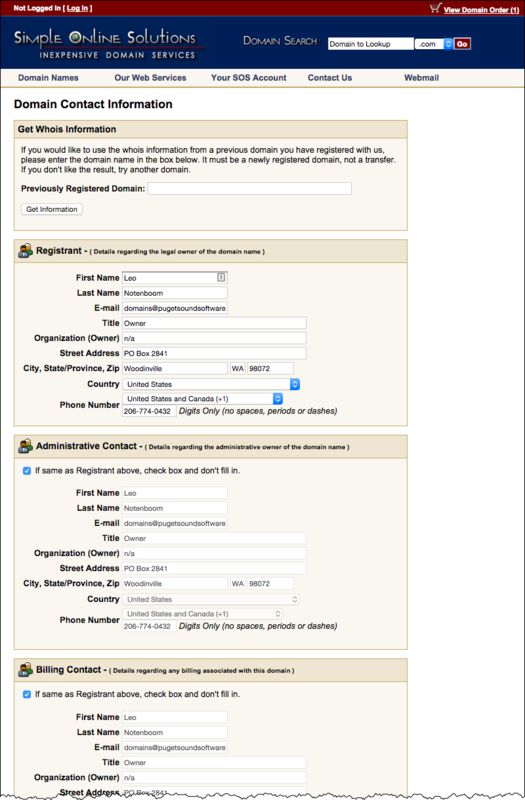 I’ll talk about specific registrars in a moment, but I use bustname.com simply as a brainstorming tool. In fact, I may not even bother to use it if I already have a domain name idea on my own. But it can be a very helpful tool when you’re stuck looking for that “perfect” domain name. Regardless of how you’ve come to the decision of what domain name you want, we need to clarify just what it means to “buy” a domain before we push any “buy” buttons. While we talk about buying a domain – and indeed, ownership of a domain can be a valuable asset – “buy” is not a 100% accurate term. “Lease” would be closer. “Registration” is perhaps the most correct technical term. 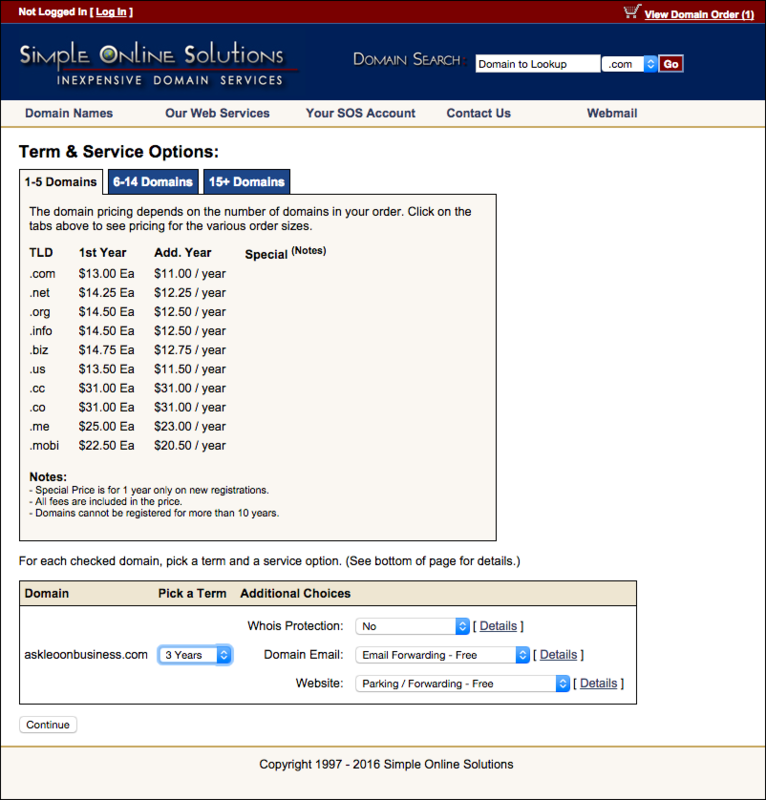 When you purchase a domain, you’re incurring an annual fee. If you stop paying that fee, the domain name will be taken away from you. In fact, there are several scenarios – ranging from malicious behavior on your part, to not playing by some important rules (which I’ll cover in a moment), to trademark infringement, which could result in a domain being taken away. Like I said, it’s more like a lease, where the “authorities” (the complex set of organizations that manage domain registration and assignment) still have the ultimate say over certain matters. Naturally, we’ll play by the rules. But perhaps the most important take-away here is that when you purchase a domain name, you’re entering into a long-term relationship with whomever you purchase it from. That makes the choice a fairly important one. Domain registrars are companies that sell domain registration. 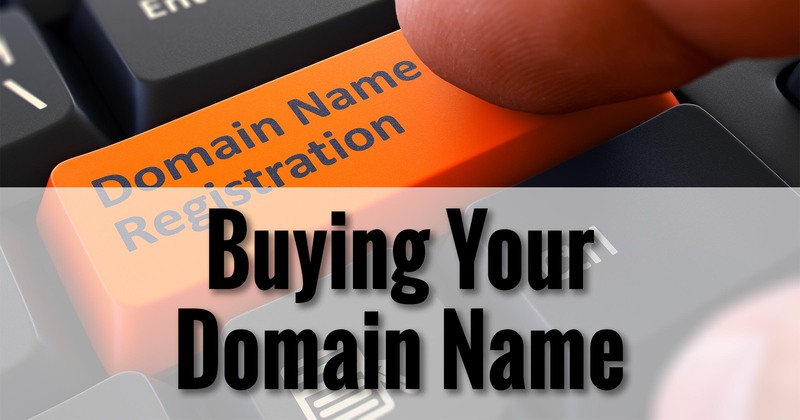 When a domain is available – meaning no one else has purchased or registered it – a registrar takes your registration information and your money and assigns that domain to you for some period of time. They then maintain a database used to record not only who owns the domain (you), but where that domain lives on the internet (the topic of an upcoming article). A domain reseller is a company that acts as a middle-man. They maintain some portion of the registration information, and take your money, of course, but the actual registration is performed by a full-fledged registrar. Often the resellers add value in some way that makes purchasing from them more attractive than purchasing directly from the registrar they work with. As we’ll see in a moment, almost all of my domains are registered through a reseller. 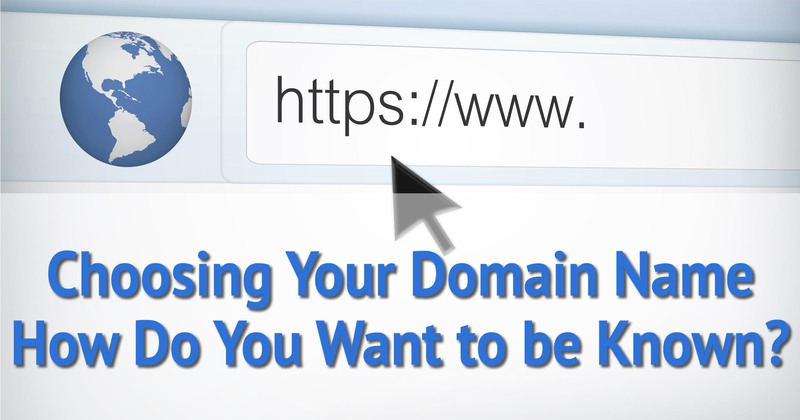 There are several important factors to consider when purchasing a domain. Support. Your domain name is what I’d call a “single point of failure” – you can register it at only one registrar or reseller, and if something goes wrong, you’re at their mercy. Knowing you have support you’re comfortable with is, in my opinion, one of the most important characteristics of a domain purchase. Security. As a single point of failure, the security of your domain registration account is incredibly important. Should someone hack or otherwise take over your account, your entire online presence could be at risk. Having good security in place is a fundamental requirement of any registrar or reseller. Reliability. In order for others to find your website or send you email, the information maintained by the registrar must be available on the internet 24 hours a day, 7 days a week. Large registrars invest heavily to minimize service interruptions that could take all of their clients offline. Cost. Purchasing a domain results in an ongoing cost. While it makes sense to minimize this cost – most domain sales advertising seems to focus on it – in my opinion, it’s not the most important aspect of your purchase. SimpleURL. This is the service I use. I have 64 domains registered here. Technically, SimpleURL is a reseller for a larger domain registrar: enom.com. I stay with SimpleURL because the service I’ve received has been outstanding, and the costs are reasonable. GoDaddy. Perhaps the best-known registrar, GoDaddy has great security, low prices, and reasonable support. In addition to domain registration, they offer a wide variety of additional services, some of which we’ll be visiting in upcoming articles. Their occasionally-aggressive marketing of those services can put some people off. NameCheap. As the name implies, NameCheap prioritizes low-cost domain registration. While not directly related to domain name purchases, I use NameCheap for my SSL certificate purchases. Amazon (AWS). I mention Amazon Web Services as an example of a kind of “higher end” service. Their Route 53 product, while technically a DNS service (something we’ll talk about in an upcoming article), also does domain registration. These are companies that I’ve done business with and feel confident mentioning. In reality, there are hundreds, if not thousands, of different registrars and resellers from which you can purchase your domain. Choosing a registrar is an often overlooked but important decision. Yes, it is possible to move your domain, should you ever decide you need to. Unfortunately, in order to prevent someone from maliciously stealing a domain registration, it’s actually a time consuming and somewhat cumbersome process. If you can, it’s best to start out in a place you can trust for a long time. If you plan to have your registration and hosting separate – meaning your domain registration will be purchased with one company, and your website and email will be hosted by another, use SimpleURL. This is the approach I use and tend to prefer, since I find that hosting needs often change over time. If you prefer to have a one-stop shopping experience where everything related to your domain, website, and email will all be provided by the same resource, go with GoDaddy. Let’s walk through the purchase of a domain at SimpleURL (more formally, Simple Online Solutions, or SOS). The approach and concepts we’ll cover apply to just about any registration service. As we saw earlier, askleoonbusiness.com is available, so we’ll purchase that. Head out to SimpleURL. In the upper right, enter the domain you wish to purchase. SimpleURL supplies the “.com”. Click on Go. As we already knew, the “.com” is available, but SimpleURL also checks availability across a number of additional top-level domains as well. 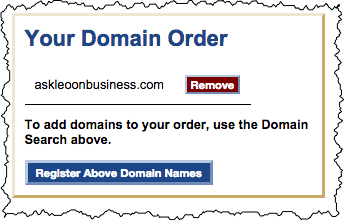 Check the box in front of the domain you want to purchase – askleoonbusiness.com, in this example – and click on Add Checked Domains to Order. The summary on the right changes to reflect your order. Click on Register Above Domain Names. SimpleURL summary of domain name order. 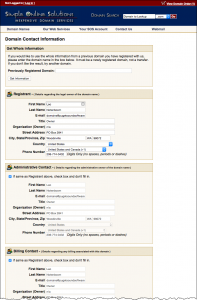 You’ll be presented with a lengthy page on which to provide your registration information. The information you provide here is public. That means anyone looking up a domain registration will find the information you provide here. There are a couple of approaches to maintaining privacy I’ll discuss below. The information you provide here must be correct. That means that the mailing address, email address, and phone number must reach you or your representative. This is one of those important rules I mentioned earlier: if this information is incorrect, you can lose ownership of your domain. And yes, they do check. 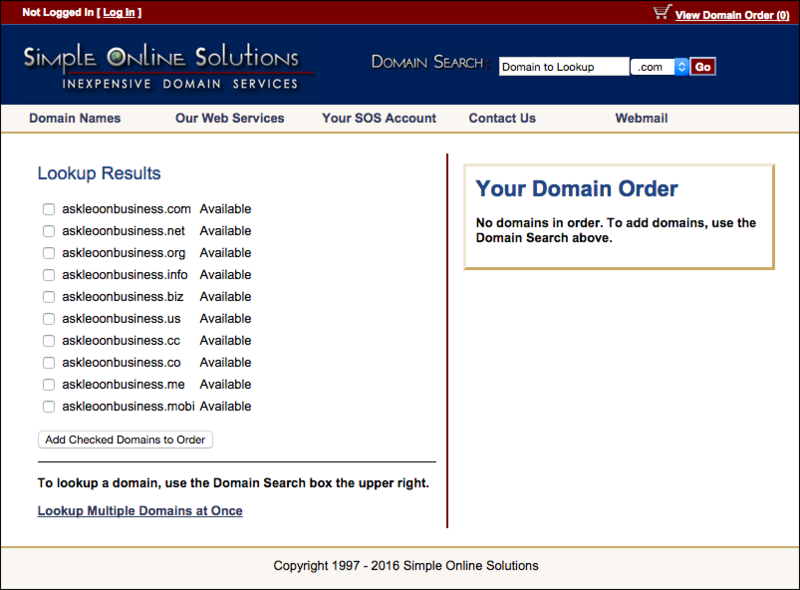 On the next page, you’ll be presented with an assortment of options for the domain name you’re about to purchase. Term. Most registrars let you pay for several years in advance. There is a theory that search engines give slightly more weight to domains that are registered for anything over the minimum of one year. I register (and renew) my “flagship” domains, like askleo.com, for the maximum allowed. With the exception of domains I might purchase for playing around or testing, my default is to purchase for three years at a time. 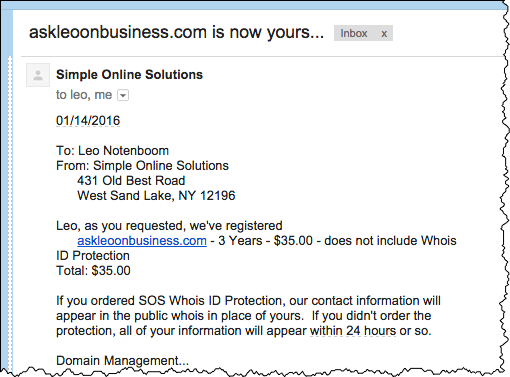 Whois Protection. This is an extra-cost option offered by most registrars. Instead of putting your information on the domain registration public records, a third party is listed instead. They forward legitimate contact requests to you, and discard all else. The other option to maintaining your privacy is the approach I use: a post office box, a dedicated email address, and a voicemail-only phone number. The choice is yours. Domain Email and Website. This basically tells SimpleURL what services you want to use with this domain. We’ll be setting up hosting and email of our own, so for now, the free defaults are perfect. NOTE: with many domain registrars you’ll be offered additional services – anything from Whois protection, as above, to hosting, SEO services, and more. My advice: decline them all unless you know they’re something you want right now. Any service you actually need will always be available later. Click Continue, and you’ll be taken to the payment and account creation page. Your account with SimpleURL will be your domain management account. 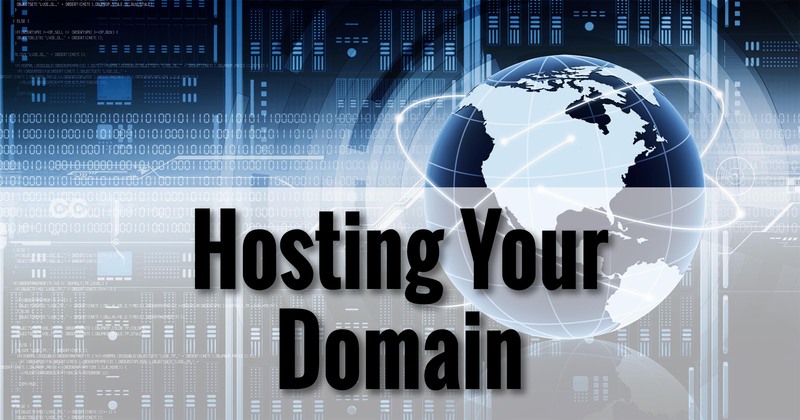 You’ll need this later to configure some of the aspects of your domain usage, as well as purchase additional domains, should that be in your future. After filling out the payment and account information, click Place Order. A short while later, you’ll receive an email. A confirmation email from SimpleURL. Congratulations! You’re now the proud owner of your very own domain name! Next up: finding that domain a home. Since this is the first post to link to actual products and services, I want to be totally above-board with you and let you know that some of those links are affiliate links. All that means is that if you purchase the product or service by clicking on a link here, I might earn a referral fee. That’ll be true for any of the links I post here on Ask Leo! On Business, and in fact has always been true for Ask Leo! itself as well. I have more information, including my philosophy on affiliate links, here in the official “Affiliate Disclosure“. You’ll find that link in the footer of every page on Ask Leo! On Business. Choosing Your Domain Name – How Do You Want to be Known? This is an official email. Please read it carefully. We are an agency for registering domain names. Our center received an application from HKERI Investments Ltd. today. They applied for the registration of ****** as their Brand Name and some top-level domain names. But we found the main body of domain names is same as yours. We are not sure about the relationship between you and them. We are dealing with the application and we need to confirm whether you have authorized them? If so, we will continue the next step of registration. If not, please let me know quickly in order to solve this promptly. Looking forward to your reply. I agree looks like spam. Or more properly perhaps a spear-phishing attempt. I’d ignore. (My GUESS is that they want to sell you your domain name on other top level domains. You don’t need ’em.) I checked your domain registration and it all looks proper – it expires in September of this year. The only thing I wish you included in this article is a general pricing idea (Rough Order of Magnitude). As you allude to, you will need to also pay a hosting company to how your website. So if you mention a pricing “Roadmap” in this first article, it would help us decide if maybe we go ahead and get our “Dream” Domain Name locked up. Obviously, once you written one on buying Hosting, then this might be a mute point. At one time, I was heavily involved in keeping the Domain name and hosting paid for, where I work. I really appreciate some of the comments about going through this important step. Actually you can see the SimpleURL pricing page above so that should give you some idea, as does the BustaName drop-down list of registrars. It can be had for less … or more. As it turns out if you purchase your domain through Amazon Web Services (as I did my “.coffee” and “.guru” domains) that’s also serviced by gandi.net.